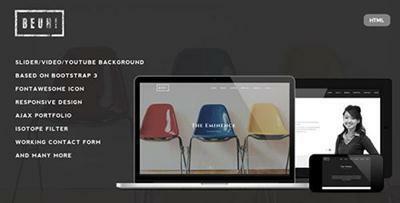 ThemeForest - Beuh - Responsive One Page Portfolio Template (Update 27 June 15) - 8375182 | Free eBooks Download - EBOOKEE! Posted on 2016-10-19, by manhneovn. Beuh is responsive one page portfolio template with clean,simple,minimalist and elegant design.It can be used for creative digital agent or even personal/freelancer to show portfolios and selling services. Its build based on twitter bootstrap ,so it has powerfull features. No comments for "ThemeForest - Beuh - Responsive One Page Portfolio Template (Update 27 June 15) - 8375182".